A very refreshing dessert on a summer evening. 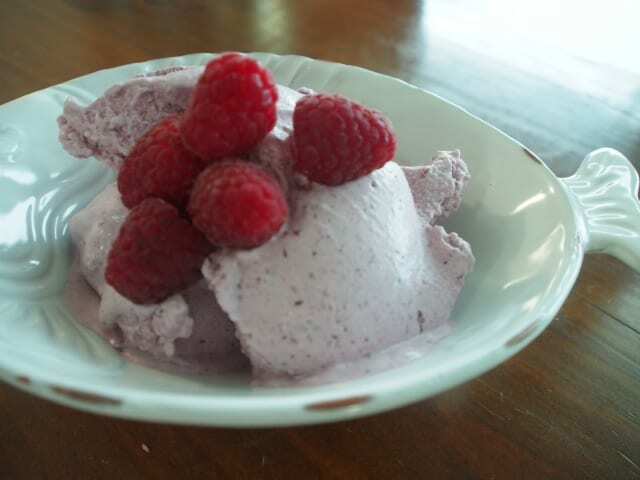 I use an ice-cream maker for this recipe but If you don't have an ice-cream maker, freeze the mixture and beat occasionally throughout the freezing process you will get a similar outcome. Put all ingredients in a blender and blend until thick and smooth. Add to ice-cream maker and follow specific instructions for your ice-cream maker. This ice-cream is best eaten as soon as it is thick and starting to freeze. This is a dessert in itself but a great addition to low carb baking. Preparation takes around 10 mins, freezing time depends on method used. I leave it in the ice-cream maker for 35 minutes or until thick and nearly frozen. Nutritional information is based on frozen berries. Carbohydrate content using mango is 5.0g per serve. I am sure that there are several other options for flavouring of this ice-cream and would be interested to hear of any other ideas.